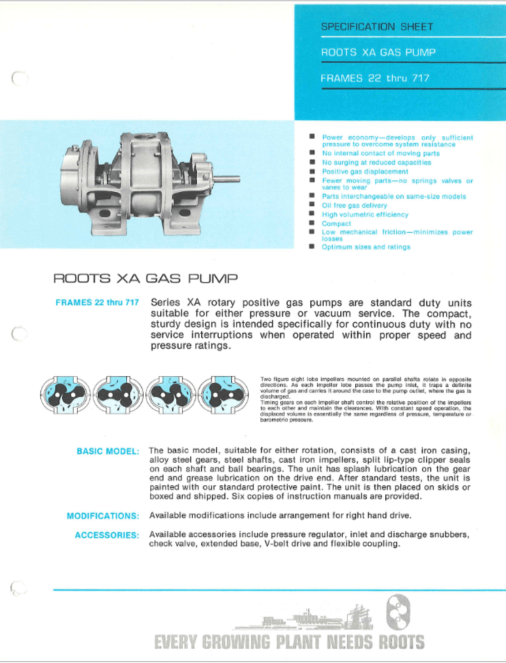 Roots XA Gas Pumps and Blowers | pdblowers, Inc. The Roots XA Gas Blower Series are now obsolete, replaced by the Universal RAI-G series. Note these are not dimensionally interchangeable. The Roots XA gas pump models are now obsolete, replaced by the Universal RAI-G units. URAI-G blowers can replace the XA models, however they are not dimensionally interchangeable; some connection sizes will be different and require system changes. The XA series were standard duty units suitable for either pressure or vacuum service. The compact, sturdy design was intended specifically for continuous duty with no service interruptions when operated within proper speed and pressure ratings. 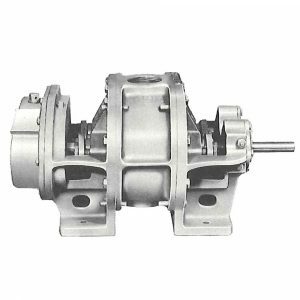 The basic model, suitable for either rotation, consisted of a cast iron casing, alloy steel gears, steel shafts, cast iron impellers, split lip-type clipper seals on each shaft and ball bearings. The unit had splash lubrication on the gear end and grease lubrication on the drive end. The standard unit had a left hand drive, but the unit could be modified for a right hand drive.